Every year from mid spring to late summer I eagerly await the appearance of dark-green خرفه (purslane) sprouts in my backyard, vegetable garden, flower borders and in between the cement cracks. The often under-appreciated and ignored purslane has always been a favorite of mine. You can throw a handful of fresh purslane in almost any dish and make it taste better with its slightly tart and peppery flavor. Purslane has high levels of omega-3 fatty acids as well as fiber, vitamin A, vitamin B, and many more nutritional values. Purslane (portulaca oleracea) has been labeled as a garden weed by the U.S. Department of Agriculture and I gave up looking for it in stores long ago. In Iran, and in many other countries, khorfeh (purslane) happens to be a popular summer green. I'm always looking for different ways to prepare purslane. However, with the little purslane that I end up gathering I can't get too creative! I usually add them to salad shirazi, mast o khiar, sabzi khordan and fruit salads. 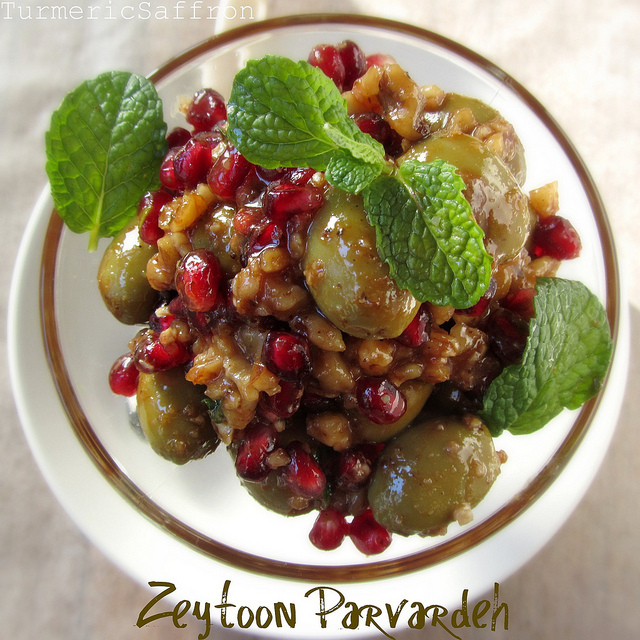 Tokhm-e khorfeh, purslane's black seeds, are used in Iranian baking and sprinkled on naan berenji and shirini keshmeshi. On a recent trip to the grocery store I was surprised to find rows of purslane nicely stacked on the shelf. They were imported from Mexico! I bought a few bunches and then decided to make کوکوخرفه kookoo khorfeh - purslane kookoo with parsley, chives and caramelized onion. Now that summer is almost behind us there are only a few purslane plants out there in the garden and I wanted to write this recipe before the season is officially over. I find it much easier to bake kookoo sabzi in the oven than on the stove-top and it doesn't require turning over the wedges/slices. For this recipe, however, I decided to cook it the traditional way on the stovetop like how my mother used to make almost all her foods. I feel that kookoo cooked on the stove comes out tastier! I understand that many of you like to add a little baking powder to kookoo dishes so feel free to add a teaspoon of baking powder to the mixture if you prefer. Heat 2 tablespoons oil in a skillet over medium-high heat and saute the onion slices until translucent, add the turmeric powder, stir. Lower the heat and continue cooking the onions, stirring occasionally until brown. Set aside. In a large bowl combine the chopped purslane, parsley, chives, caramelized onion, walnuts, eggs, red pepper and season with salt and black pepper. Heat 3 tablespoons oil in a 10-inch skillet over medium heat, pour in the egg mixture and spread evenly. Cover and cook for 30 minutes on low. Cut the kookoo in 8 equal wedges. Carefully turn over the slices half way through cooking using a fork and a spatula. You can also slice the kookoo after it is fully cooked. Serve warm or at room temperature with mast o khiar, salad shirazi, torshi and warm bread.